Earlier analysis of the Archimedean and Catalan solids constructed from the tetractys — the template of straight-line, sacred geometry — revealed that the disdyakis triacontahedron (the Catalan solid with the most vertices) embodies the structural parameter 1680 of the E8×E8 heterotic superstring. This article completes the analysis by proving that this polyhedron also embodies its structural parameter 840. The triakis tetrahedron (the simplest Catalan solid) and the disdyakis triacontahedron are the polyhedral version of Plato’s Lambda Tetractys, whose numbers generate the tone ratios of the notes of the Pythagorean musical scale. 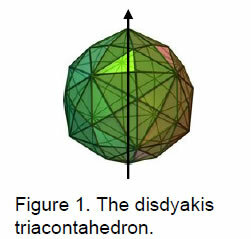 The 120 faces of the disdyakis triacontahedron contain 480 hexagonal yods. They symbolize the 480 roots of E8×E8 and are the counterparts of the 480 hexagonal yods of the two similar sets of seven regular polygons that constitute the inner form of the Tree of Life. The direct product nature of this gauge symmetry group reflects the fact that each face and vertex of the disdyakis triacontahedron has a mirror image. 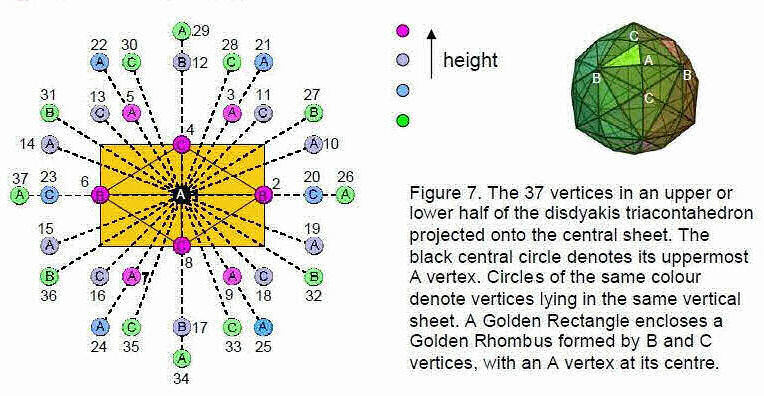 In previous articles, it was proved that, when each of the 120 triangular faces of the disdyakis triacontahedron (Fig. 1) is constructed from three tetractyses and the triangles in its interior are turned into single tetractyses (case C), there are 1320 geometrical elements surrounding its axis. When its faces are single tetractyses and the interior triangles are divided into three tetractyses (case A), there are 1680 elements surrounding its axis. When its faces are each divided into three tetractyses and its internal triangles are divided into three triangles (case B), there are 2400 elements surrounding its axis. In this article, we shall consider the final possibility (case D), wherein internal triangles and faces are single tetractyses. Of the four possible cases, only cases B and C have counterpart transformations in the Archimedean and Catalan solids because consistency of construction requires a face that is a regular polygon with n sides to be divided into n triangular sectors. The central axis passing through two such vertices consists of three corners of tetractyses (two polyhedral vertices and its centre) and two edges of tetractyses (Fig. 2). Seven yods lie on the axis (three corners and four hexagonal yods). Number of vertices ≡ V = C + 1. Number of vertices surrounding axis ≡ V' = V – 3 = C – 2 = E – F.
Number of edges ≡ e = C + E. Number of edges surrounding axis ≡ e' = C + E – 2. 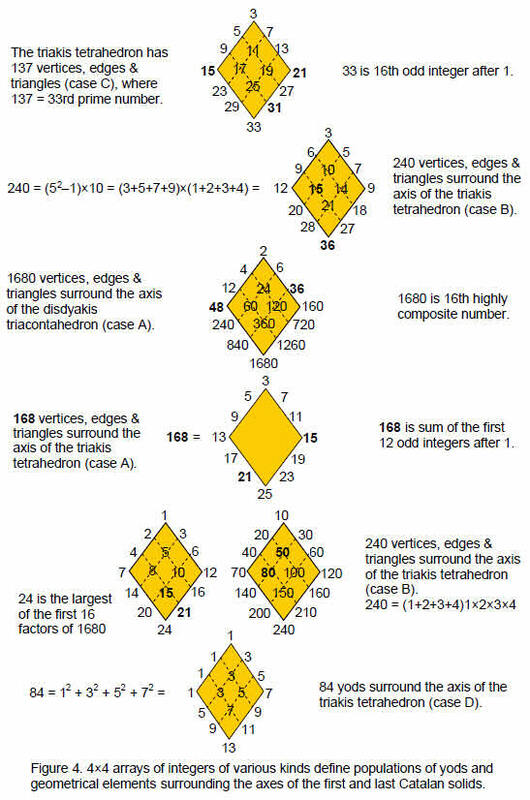 Number of triangles ≡ T = E + F. Number of triangles surrounding axis = E + F.
Total number of geometrical elements ≡ N = 2C + 2E + F + 1 = C + 3E + 3. Number of geometrical elements surrounding axis ≡ N' = C + 3E – 2. Table 1. Numbers of geometrical elements in the Catalan solids (case D). polyhedron because, counting firstly the five Platonic solids, then the 15 Archimedean solids and, finally, the Catalan solids, the triakis tetrahedron is the 21st polyhedron. The Godname YAHWEH with number value 26 assigned to Chokmah prescribes the triakis tetrahedron because its 18 tetractyses have 26 edges. Two edges form its axis, so that 24 edges surround it. The 60 geometrical elements surrounding the axis comprise 24 edges and 36 vertices and triangles. The counterpart of this in the Tree of Life is the fact that, constructed from 16 tetractyses, it has 60 yods other than the ten Sephiroth at their corners (Fig. 3). Each yod symbolizes one of the geometrical elements in the triakis tetrahedron. The 24 yods below the apex of the Tree of Life down to the path connecting Chesed and Geburah denote the 24 edges around the axis and the 36 yods below the path denote the 36 vertices and triangles that surround it. This is striking evidence that the triakis tetrahedron is the polyhedral counterpart of the outer form of the Tree of Life. Number of corners of tetractyses = C. Number of corners surrounding axis = C – 2 = E – F.
Number of hexagonal yods on edges of tetractyses = 2E. Number of hexagonal yods at centres of tetractyses = F.
Total number of hexagonal yods ≡ Hs = 2E + F.
Number of yods surrounding axis ≡ Ns = C – 2 + Hs = C – 2 + 2E + F = 3E. Number of corners of tetractyses = 1 (centre of polyhedron). Number of hexagonal yods on edges of tetractyses ≡ 2C. Number of hexagonal yods at centres of tetractyses = E.
Total number of hexagonal yods surrounding axis ≡ Hi = E + 2C – 4 = 3E – 2F. Total number of yods surrounding axis ≡ Ni = Hi = 3E – 2F. Total number of corner yods surrounding axis ≡ C' = C – 2 = E – F.
Total number of hexagonal yods surrounding axis ≡ H = Hs + Hi = 5E – F.
Total number of yods surrounding axis ≡ N = C' + H = 6E – 2F. Table 2. Numbers of yods in the Catalan solids (case D). 62 = 1 + 3 + 5 + 7 + 9 + 11. The 21 odd integers adding to 91 demonstrate how the Godname EHYEH with number value 21 prescribes the yod population of the triakis tetrahedron. As 15 integers lie on the boundary of this triangular array, it also shows how the Godname YAH with number value 15 prescribes this number. that surround its centre. The sum (36) of the integers at the corners of the tetractys corresponds to the 30 internal yods and the six vertices surrounding the axis. The sum (48) of the six integers at the corners of a hexagon in the Lambda Tetractys corresponds to the 48 hexagonal yods in the faces of the polyhedron. The Lambda Tetractys generates the tone ratios of the notes of the Pythagorean musical scale as ratios of pairs of integers.6 The sums 36 and 54 of, respectively, the integers at its three corners and the integers at the centre and corners of a hexagon also define the perfect fifth with tone ratio 3/2 because 54/36 = 3/2, whilst the sums 36 and 48 define the perfect fourth with tone ratio 4/3 because 48/36 = 4/3. The triakis tetrahedron also defines the perfect fifth because its faces and interior have, respectively, 36 and 24 geometrical elements surrounding its axis, and 36/24 = 3/2. 17 19 23 29 . 15 17 19 21 .
arises from the inversion symmetry (Fig. 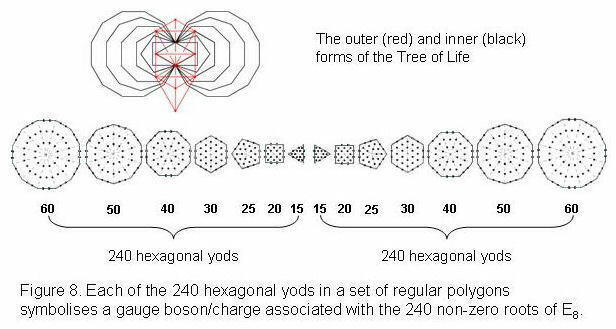 7) of the polyhedral Tree of Life because 60 faces contain 240 hexagonal yods and their 60 mirror images contain 240 hexagonal yods as well. The counterpart of this mirror symmetry in the polygonal, inner form of the Tree of Life is its two sets of seven regular polygons, one being the mirror image of the other (Fig. 8). yods. A yod denotes a gauge boson and gauge charge associated with those generators of the Lie algebra of E8 that are defined by its 240 roots. As with the disdyakis triacontahedron, the fact that one set of polygons is the mirror image of the other explains why the gauge symmetry group of this superstring is the direct product of two identical groups E8. 480 = 48×10 = (3+5+7+9+11+13)×(1+2+3+4). 240 = 24×10 = (3+5+7+9)×(1+2+3+4). where 72 is the sum of the four smallest integers and 168 is the sum of the four largest ntegers. This division is therefore determined by the Tetrad (4). Fig. 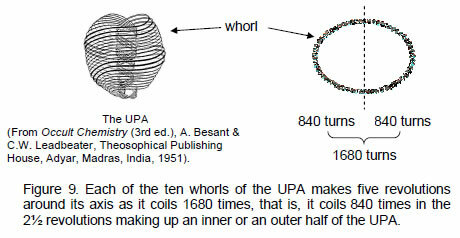 9 depicts the UPA (‘ultimate physical atom’), the fundamental unit of matter described by Annie Besant & C.W. Leadbeater. Identified by the author as the E8×E8 heterotic superstring constituent of quarks, this object consists of ten closed curves, or ‘whorls.’ In the ‘positive’ type of UPA, the whorls wind clockwise around the axis when viewed from the top. In the ‘negative’ variety, they wind anticlockwise. Fig. 9 shows a positive type of UPA. The uppermost three whorls, called ‘major whorls,’ are different from the seven others (called ‘minor whorls’) in ways that need not be discussed here. The 3:7 division between these two types of whorls is the manifestation of the ontological distinction in the Tree of Life map of all beings between the Supernal Triad of Kether, Chokmah and Binah and the seven Sephiroth of Construction. In the context of the tetractys, wherein each yod symbolises a whorl, the major whorls correspond to the yods at the corners of the tetractys and the seven minor whorls correspond to the seven yods at the corners and centre of a hexagon. According to the author’s research, 24 gauge charges of E8 are spread along each curve. This means that the three major whorls carry 72 charges of E8 and the seven minor whorls carry 168 charges. This is the superstring counterpart of the 168 geometrical elements surrounding the axis of the triakis tetrahedron in case A and the extra 72 elements added to its faces in case B. The 240 geometrical elements that surround the axis of this polyhedron in the latter case represent degrees of freedom whose counterparts in the E8×E8 heterotic superstring are its 240 E8 gauge charges. Each whorl is a helix with 1680 turns. It is a standing wave with 1680 circularly polarised oscillations. This is the string manifestation of the 1680 vertices, edges and triangles surrounding the axis of the disdyakis triacontahedron in case A. Figure 8 shows that a whorl makes five revolutions around its axis. It winds 2½ times in an outer spiral, making 840 oscillations, and 2½ times in a narrower spiral, making another 840 oscillations. Alternatively, there are 840 turns in a half-revolution of five whorls. This is the string manifestation of the 840 yods surrounding the axis of the disdyakis triacontahedron in case D (see Table 2). There are 168 turns in a half-revolution of a whorl and 84 turns in a quarter-revolution. This is the string manifestation of the 84 yods surrounding the axis of the triakis tetrahedron. The ten-fold difference between the populations of yods or geometrical elements in the first and last Catalan solids has its counterpart in the heterotic superstring as the ten half-revolutions of each whorl and as the ten quarter-revolutions in the inner or outer half of a whorl. The disdyakis triacontahedron embodies the number of oscillations in each whorl of the superstring made during 2½ revolutions (case D) and five revolutions (case A). Magnified by the Pythagorean factor of 10, the Lambda Tetractys is an arithmetic version of the disdyakis triacontahedron. The central integer 6 corresponds to the central axis. In the triakis tetrahedron, it denotes the six yods on the central axis on either side of the centre of the polyhedron. The sum of the seven integers at the centre and corners of a hexagon is 540. This is the number of yods on the sides of the 300 tetractyses needed to construct the polyhedron. The number defining the edges of these building blocks is determined aptly by the very numbers whose positions in a tetractys are occupied by yods that symbolize the seven Sephiroth of Construction. (see table in Ref. 1). This is not coincidental but, instead, an example of the remarkable, designing potency of the Godnames. 650 = 543 + 26 + 50 + 31. It is also the number of yods other than corners associated with each set of seven enfolded polygons when each of their 94 sectors is divided into three tetractyses (Fig. 10). In other words, it is the number of extra yods needed to construct each half of the inner Tree of Life — its actual form, in keeping with the meaning of Malkuth. 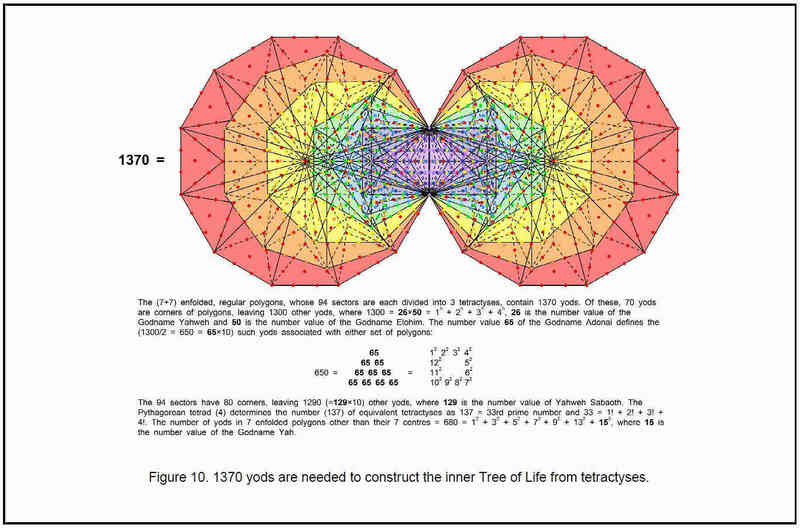 The significance of this is that the lowest of the 91 overlapping Trees of Life mapping the spiritual cosmos has 250 yods below its apex when each of its 19 triangles is divided into three tetractyses (Fig. 11). Below this point, there are 60 yods on its 25 paths and 190 yods inside its triangles. As already pointed out, the apex is the 540th emanation, where 540 is the sum of the six integers at the corners of a hexagon that surround the central integer 60. The sum 250 is therefore the number of yods in the lowest Tree of Life below the 540th emanation. The lowest tree corresponds to Malkuth, so it is apt that the Godname ADONAI of this Sephirah of Construction has the very number value 65 that specifies the base of four integers and hence the six remaining integers of the Lambda Tetractys whose sum is the number of yods in this tree. Table 3. Number values of the Sephiroth in the four Worlds. surrounding its axis (or, alternatively, to its 60 faces and their mirror images. They are symbolized in the lowest Tree of Life by the 60 yods below its apex that lie along its paths and thus create its shape. In this sense, Plato’s Lambda marks out uniquely the disdyakis triacontahedron, for it is the only Catalan solid that has 60 vertices and 840 yods surrounding its axis. As Table 1 shows, these 840 yods are associated with 600 vertices, edges and triangles — a further illustration of how the root number 6 at the centre of the original Lambda Tetractys determines the nature of the sacred geometry of the disdyakis triacontahedron. In music, it fixes the frequency, or pitch, of the starting note (tonic) of the musical scale as unity, so that the ratios of the other integers to 6 are the tone ratios of the notes. The integer 6 is the starting point for the Pythagorean musical scale, its diversification in the seven octave species, the Tree of Life counterpart of the Lambda Tetractys and its polyhedral equivalent — the triakis tetrahedron and the disdyakis triacontahedron. 1The Sephiroth exist in the four Worlds of Atziluth, Beriah, Yetzirah and Assiyah. Corresponding to them are the Godnames, Archangels, Order of Angels and Mundane Chakras. Table 3 above gives their number values calculated by the practice of gematria, wherein each letter of a word has a number assigned to it, giving a number value to the word that is the sum of the number values of its letters. Numbers from this table that are referred to in the article are written in boldface. 2 Phillips, Stephen M. Article 27: “How the Disdyakis Triacontahedron Embodies the Structural Parameter 1680 of the E8×E8 Heterotic Superstring,” (WEB, PDF), pp. 2–3. 5 Phillips, Stephen M. Article 5: “The Superstring As Microcosm of the Spiritual Macrocosm,” (WEB, PDF). 6 Phillips, Stephen M. Article 11: “Plato’s Lambda — Its Meaning, Generalisation and Connection to the Tree of Life,” (WEB, PDF), pp. 2–3. 7 Phillips, Stephen M. Article 3: “The Sacred Geometry of the Platonic Solids,” (WEB, PDF), p. 20. 8 Ref. 2, pp. 5–6. 9 Phillips, Stephen M. Article 22: “The Disdyakis Triacontahedron As the 3-dimensional Counterpart of the Inner Tree of Life,” (WEB, PDF), pp. 3–4. 10 Phillips, Stephen M. “The Mathematical Connection between Religion and Science” (Antony Rowe Publishers, England, 2009). 11 Ref. 6, pp. 4–7. 12 Phillips, Stephen M. Article 23: ““The Polyhedral Tree of Life,” (WEB, PDF), pp. 8, 14.